Every year at the end of May, the publishing world comes together for Book Expo America, a giant conglomeration of publishers, authors, agents, distributors, librarians, journalists, media representatives, and various hangers-on to celebrate the written word. Many of the Storey team will be headed to New York from May 25 to 27 to showcase our Fall 2010 releases, promote current books, and troll the floor for new ideas, trends, authors, and media contacts. I love going to BEA because I used to work for a few of those big guys before I made the better-life choice of moving to bucolic Western Massachusetts, and I look forward to catching up with old friends, looking at baby/child pictures, and hearing what the rest of the world is up to. I'm thrilled to be hosting Sherri Brooks Vinton, author of Put ’em Up! 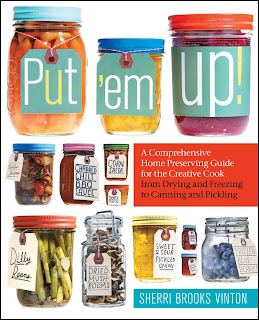 in our booth for a signing on the first day of the show — this book will change your perception of canning and preserving, and Sherri is an important voice in the "Buy Local" campaign; plus, she's really fun to hang out with. There are millions of seminars, panels, meet-ups, educational talks, and networking events that I usually miss because I like the excitement of being on the show floor. I always meet really interesting (and sometimes cuckoo) folks, and there is usually a meeting of some kind happening in our booth with a buyer, a sales rep, a publisher, an agent . . . a visitor can definitely get a world view of the publishing process from soup to nuts over the course of a day or two. I like to team up with the various publicity directors from Workman's other imprints to share media contacts, get a heads-up on who is in the area to nab for an author booking, and exchange stories of what exhibitor has the best swag. The giveaways are legion; you can probably accomplish your holiday shopping in a few hours if you put your mind to it. This year the big excitement is that Barbra Streisand will be the keynote speaker to open the show on Tuesday evening. There have been about a hundred e-mails detailing the "procedure" for garnering a seat to hear her speak about, of all things, decorating. I'd probably pay a king's ransom to hear her talk about, say, singing — but decorating? And did I mention it's free? Hmmm. I've maintained for months now that she'll cancel, but we'll see. . . . So if you'll be at the show, come see us in the Storey booth. It's like a beehive, an apt metaphor for our publishing program and the activity that surrounds us!